The current marketing blitz for Warner Bros' upcoming "Wonder Woman" has included a number of posters but this latest poster, revealed by DC Comics president and CCO Geoff Johns on Twitter, is arguably the best one yet. 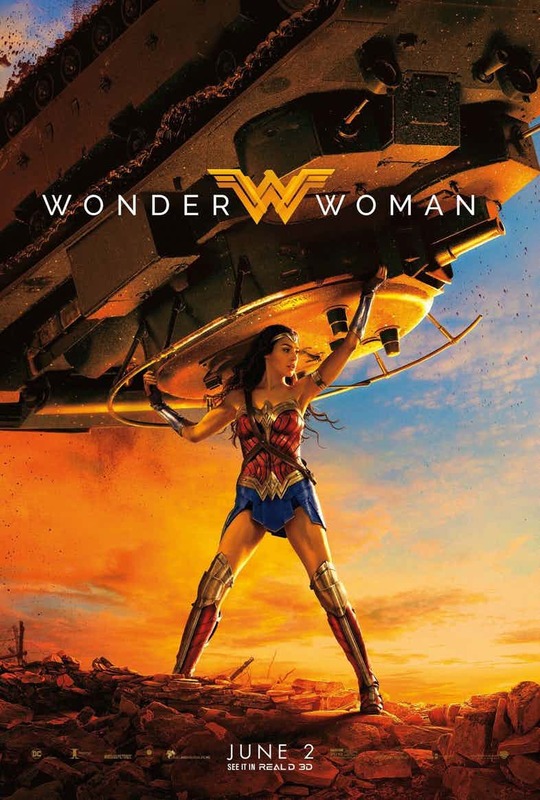 Using the same bright rich color scheme of the other posters, Wonder Woman (Gal Gadot) stands triumphantly holding a tank over her head while looking regal and powerful. The poster is reminiscent of the iconic cover of Action Comics #1 featuring Superman holding a car in a similar way. Although, this isn't the first time the Amazon princess has posed like this. Wonder Woman superfan Vaughn Mounsey‏ reminded fans of that fact on social media. The new poster also promotes RealD 3D, the standard technology for 3D movies since 2005, and it's hard to not want to see "Wonder Woman" in three dimensions after seeing this poster. Wonder Woman opens June 2 and is directed by Patty Jenkins. It's written by Allan Heinberg, Geoff Johns, and Zack Snyder. Also starring Chris Pine (Steve Trevor), Robin Wright (General Antiope), Connie Nielsen (Queen Hippolyta), David Thewlis, Elena Anaya, Lucy Davis (Etta Candy), Danny Huston, Ewen Bremmer, Doutzen Kroes, Samantha Jo (Euboea), Florence Kasumba (Senator Acantha), Said Taghmaoui, Eleanor Matsuura (Epione), Emily Carey (Young Diana), and Lisa Loven Kongsli (Menalippe). UPDATE: Now you can own this beautiful poster courtesy of RealD.